Internet use on mobile devices such as tablets and Smartphones has been steadily increasing the last few years, and is now taking over from desktop Internet browsing as the primary method. However, it is also important to highlight the word "browsing". In other words, most Internet usage on a mobile device (particularly Smartphone) is done so for more basic browsing and research purposes. Responsive Website Design has become the new norm, ensuring a website has a far greater reach to potential viewers on the move, and when they do visit the site, making sure they have a more pleasant and efficient browsing experience. Stay ahead of the game, and make sure your website is properly optimised for mobile browsing. People are spending more time on their mobile device - Tablet and Smartphone - than ever before. The rate of internet usage on mobile phone is growing at phenomenal speed. In fact, by 2014 it will overtake desktop PC browsing. In some developing countries, users have jumped directly to mobile browsing. In Q1 2013, tablets exceeded traditional desktop devices for conversion rates for the first time suggesting people are increasingly comfortable with the experience of buying on tablets. It's a different story for Smartphones, converting at one third of the rate of traditional or tablet devices. Hence, Smartphones are more of a browse or research platform while on the move rather than a buy platform. One half of all local searches are now performed on mobile devices. Most people utilising the Internet on a mobile devices are multitasking, i.e. watching TV, commuting on transport. 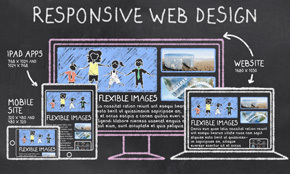 Responsive websites automatically adapt design according to the device, such as mobile, tablet, PC, Smart TV. This ensures optimal, consistent and easy browsing experience for the user across all devices. At Web Conceptions, our understanding of the process in making a fully responsive website comes with many years experience and know-how; in technical development and testing, research and marketing, content creation, as well as in overall user experience design. Responsive web design (RWD) is an approach aimed at making websites in a way that provides optimal viewing experience, with easy reading and navigation logic achieved via a minimum of resizing, panning, and scrolling. Essentially, the viewing screen width adjusts automatically according to the device being used. Since there are so many devices available - and more continually being introduced - a responsive website ensures your site is adaptable to a greater range of website browsing devices. Responsive websites are used across a wide range of devices, including mobile phones, tablets, and desktop monitors. Although website layout adjusts for tablet devices, it is the layout of Smartphones that truly stands out as being different; utilising a single column scrolling navigation. In other words, a non-responsive website would still function quite well on tablet devices, but perhaps sometimes not so well on Smartphones. No doubt, when building a website for professional purposes - business or organisation - it is important to consider your website's view on mobile devices, and consider a responsive website design within an overall solution. The question is no longer "Should we invest in mobile friendly websites?" but "How should we invest in mobile friendly websites?" There are three main approaches to providing information and interaction to mobile device users: Responsive (and adaptive) web design, separate mobilised websites with a unique URL, and mobile applications. The debate on which design option is the best is huge, and indeed has valid arguments for all sides. Overall, which option is best for your business/organisation will no doubt depend on your case, your users' habits, and, of course, your budget. Each has many pros and cons. The main point is that it really depends on the project at hand and which of these pros and cons are most relevant. If it's a totally new build site, it seems much better to build responsively. If it's not, then it really depends on each client. However, it's also important to note then when your site is heavily dependent on interactive components, then a mobile website is a better option. Consistent message & branding: responsive websites allow for the best user experience possible, as the website is standardised and offers consistency in browsing, content and functionalities across multiple devices. Easier & more efficient in managing content: with responsive websites, all content is available to the user and the design simply changes according to device type. There is no need to host content in two separate locations. Thus, responsive websites are simpler to manage from a resource point of view. Search Engine Optimisation (SEO): because content in a responsive website is not staggered across multiple locations such as in mobile specific websites, it creates a more efficient and consolidated SEO strategy. All web content sits in one location, therefore can more quickly build credibility with search engines, trust, build and share links, and ultimately stronger organic search ranking. It also helps search engine's algorithms assign indexing properties for it. More simple to develop & maintain: a responsive (and adaptive) web design draws on the same code as a desktop (classic) site, and will present the same URL at the browser. It eliminates the need for a separate mobile presence, allowing the website owner to have a single site at a single URL with a single code base and set of files to be used. This makes a website significantly easier to maintain; and develop (more affordable). Mobile sites might hide content that a user is actually seeking: a mobile website is a simpler version of the standard website made for devices with smaller screens. Typically, mobile versions of a website are located in a specific subdomain or subdirectory, such as m.website.com or www.website.com/mobile/ and offer less features than the standard website due to usability constraints. However, there may very well be content that the user specifically wants, but can't find because it's been stripped out. A responsive website does not take away any content, only adjusts the way it is presents; and presents all information available on the classic website design. Speed: if defined, designed and developed correctly, a responsive website will generally load faster. Standalone mobile Applications: mobile apps fill the gap in content and feature-rich experiences left by their mobile website. While apps can be much more powerful than mobile websites, the downside is that it requires a user to install and refer specifically to it. In other words, they do not capture organic search visits. It seems best to utilise mobile apps in conjunction with a full responsive website. Web-Conceptions and Search Engine Giant Google prefer this option as opposed to mobile specific websites. At Web-Conceptions, our main goal as developers is to build a fully functional and nice-looking website that succeeds in search engine ranking (SEO), and therefore generates greater online presence. This then boosts chances of online success. Thus, a responsive website is the way to go. "We don't necessarily want [our advertisers] to have mobile sites... I find I get frustrated on my phone when I hit these mobile sites... I just find it confusing... As an industry, we need to improve these experiences... I'd almost say that we shouldn't be designing for mobile. The kind of mobile phones we have now, the state of the art, are a little bit beyond, and those experiences [i.e., full websites] should work on those devices as well. I'd like to see us move in that direction." The world's leading search engine telling you how to manage your mobile website. As a website owner, I'm guessing this is the approach you should want to take.